Wife: How much do u love me...??? 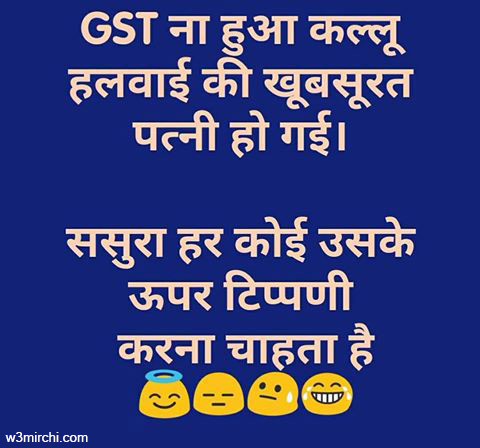 Husband: 28 % GST on luxurious items...!! 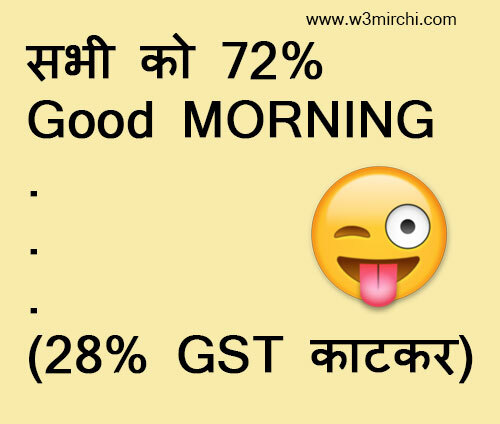 Wife: Now-a-days, people are talking very much about GST. What is this GST? She asks her husband. Husband: It is not so easy to understand. Okay, listen to me; I will try to explain with a very simple example of my life. When I was not married, if I came home at late night, first I had to give explanation to my sister at the door why I was so late. Then, it is to my mother and lastly to my father. Now after marriage, if I get late, I need not give explanation for three times, only single explanation to you solves the problem. This is the brief idea about GST. Now are you clear? टीचर वाह , तुम्हे कैसे पता चला ? फूफा के रूठने से ब्याह नही रूका करते..